Bedford Skin Clinic offers the latest and the most effective skin peel treatment – Obagi Blue Peel. This highly advanced treatment is very effective for blemishes, acne scars, wrinkles, uneven pigmentation and sun damage. The procedure is performed by a doctor, who has specialised training and experience with this highly effective peel. A low concentration of chemical trichlororoacetic acid (TCA) is mixed with a special blue base. This allows to regulate the depth of the peel and remove the surface layers of aged and damaged skin. These damaged cells are replaced by healthier ones, making the skin look healthier and younger. The FDA approved Obagi Blue Skin Peel can be applied to the neck, chest, hands, back, arms, legs and other parts of the body. It can dramatically improve your complexion. The Obagi Blue Skin Peel is a quick, relatively simple and highly tolerable procedure. Application of the Obagi Blue Peel takes approximately half an hour. 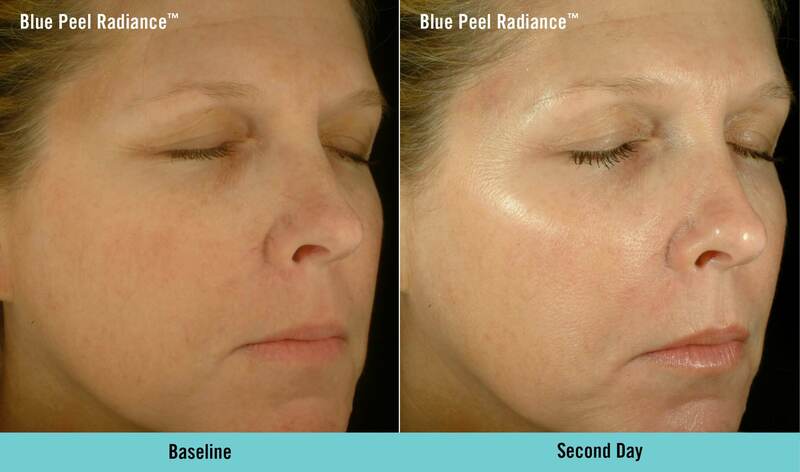 After the Obagi Blue Peel, you may experience light swelling and redness of the face. Your skin will begin to peel within 48 to 72 hours and will continue to peel over several days. The healing time is approximately 7 to 10 days. After peeling stops, a new improved complexion is noticeable. The skins condition will continue to get better over a period of months giving it a firmer, clearer, smoother and healthier appearance.